Manila - Department of Interior and Local Government (DILG) Secretary Mar Roxas II today instructed the Philippine National Police (PNP) to ensure the safety of millions of devotees of the Black Nazarene who are expected to join the annual procession in Manila tomorrow, January 9, 2014. “Inaasahan ko na susundin ng PNP ang security plan na binuo nila para siguruhing ligtas sa kapahamakan ang lahat ng dadalo sa prusisyon,” Roxas said. The image of Black Nazarene is believed to be miraculous. During the annual procession, devotees attempt to touch the religious image, believing that by doing so, they will be blessed with good health and their prayers answered. After the solemn mass, which will be led by Manila Archbishop Luis Antonio Cardinal Tagle at 6 a.m., the procession will start from the Quirino Grandstand and will end at Plaza Miranda in Quiapo. 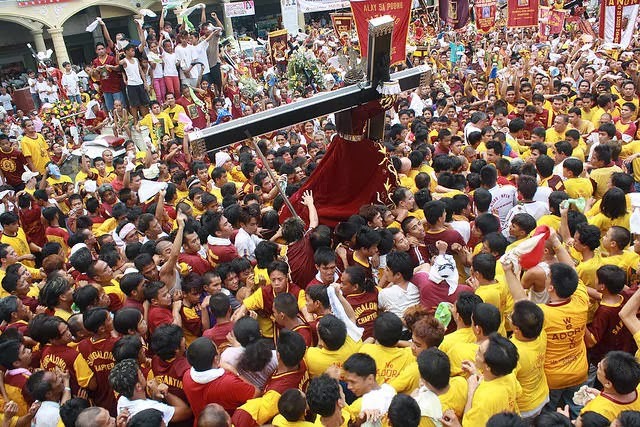 The NCRPO chief earlier announced that security preparations are already in place for the annual procession parading the image of the Black Nazarene. A total of 6,000 policemen coming from various district police offices in Metro Manila will augment the Manila Police District to ensure peace and order during the entire procession. Some 10 million to 12 million are expected to attend this year’s procession. The annual event has become a security concern because of the sheer volume of people coming together and the possibility of a stampede. Roxas said that emergency medical units from the Bureau of Fire Protection (BFP) will be deployed in various parts of Manila to address this concern. “Pinaghahandaan natin ito taun-taon kaya dapat na maayos itong matapos na walang nasasaktan o namamatay,” Roxas said. The DILG chief, at the same time, directed the city’s barangay units to be on alert to provide assistance to devotees in case of emergency. He also directed barangay units to help the Metro Manila Development Authority (MMDA) in the cleanup and disposal of wastes after the procession.